Meeting "celebrities" in Los Angeles at Sony Studio. Was a great day and met with those who use Skills and Knowledge to gain Fame. Be sure to bring some "red" with you for both luck and recognition of fame when you try out for your 15 minutes of fame! A new member of Lauren's fur family is a sweet fluff ball named Snowball. This little one is very smart and very clever when finding play things around the house. Most fun for Snowball is to pounce on the other cats as they come through the cat door. Not so fun for the more "Sr." kitties. A good thing to do is to add a green bowl or food dish to the feeding area when a new one comes into a home. Green is the color of family and is a great color to use as all get used to new family members! This little one made one of the original fur family members "green" with envy. Watch that you give your more established fur folks lots of extra attention as new ones come in. 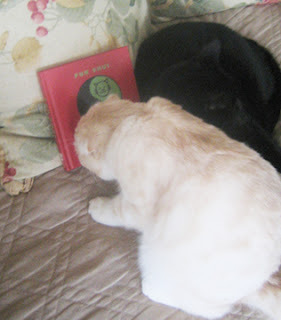 All is well now...of course since Snowball has read Fur Shui cover to cover! Cuddling next to Snowball is CG, Snow's new bff! 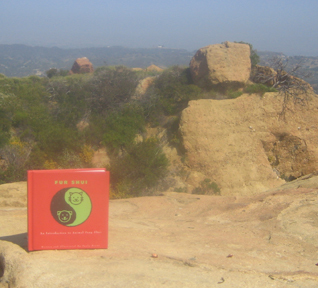 Still hiking SoCal...this time closer to home at Palos Verde just South of LA and North of the LA harbor at Long Beach. Beautiful views, migrating whales pass by this stretch of the coast and the light house shines to all at the rocky outcrop warning all about "land ho"! Water everywhere. This is the element of the career life space and it flows from rivers and creeks all the way down to the Pacific Ocean. Our body make up is almost all water...so, be sure to hydrate often while hiking, get into the flow of who you are and enjoy all the natural beauty that is around you! 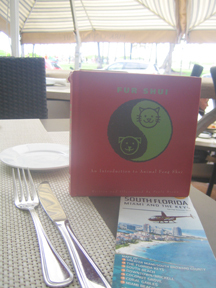 Fur Shui loves helping out both fur and non fur folks with their life path flow and "jobs". Just place a sturdy water dish for your pooch or kitty by the front door so they can also re-hydrate and bring that career chi into your home for you to use and enjoy! Sketching in nature is a favorite thing of mine to do! 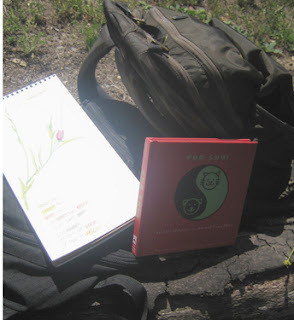 While teaching a connect to nature class at the Irvine Nature Conservancy recently we visited Limestone Canyon to see what we could draw and observe. 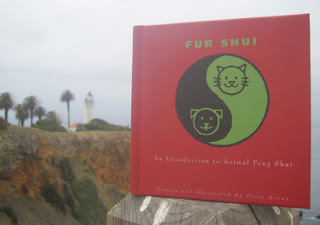 Fun day for Fur Shui to "take the day off" and visit some green and golden hills in Santiago Canyon area outside of Irvine, CA. The greens were turning to gold, good for the health, yellow and gold being the color of the health gua. Still hiking! Fur Shui discovered Eagle Rock up in Topanga Canyon this summer. Lots of interesting forms and valleys to view. Earth is the element of health life space. There are some pretty impressive boulders to explore and see at the end of this hike. Stones can make up some pretty strong energy pathways for Feng Shui. So when you see some stones that look like turtles...connect them to each other and you can find healing and protection energy for you and your fur friends. This is the "Form School" of Feng Shui that reflects patterns and chi in nature! 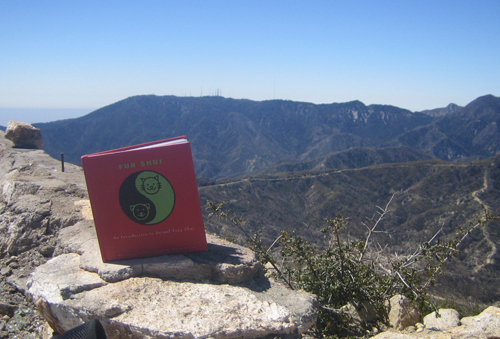 Fur Shui has been out and about hiking in LA! The Los Angeles Forest is re-cooping from the massive forest fires of 2007. The view atop Mt. Vetter in the Angeles Forest is breath taking. Wonderful day, new growth and hope for the damages made to the lovely hiking paths in and around the area. Too much "fire" energy can and is destructive. If you or your animal has energy that is way over the top, just tooooo much, calm it down a bit with the energy of "water" with some black accessories; leash, collar, food and water dish. 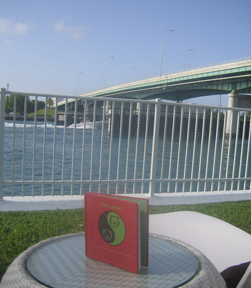 Let the flowing qualities of water help with the abrupt forceful energies of fire! Ready, set, aim...FIRE! 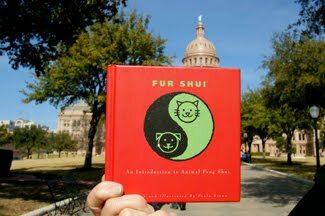 Fur Shui is still touring Austin Texas. 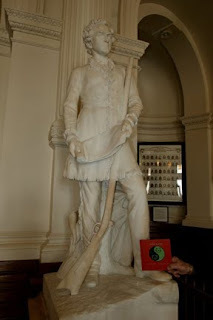 Now alongside a powerful black canon that guards the state house doors. When it comes to career, black is the color and can be pretty powerful indeed. 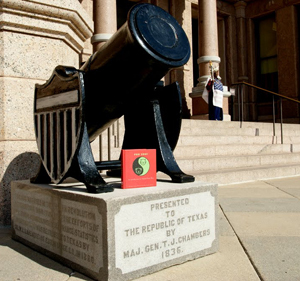 This canon is at the entrance doors so it is acting as a "protector" to the life path and entrance of Texas so to speak! Fame is the color of red which is all about the book...and some pretty powerful canon shots have begun by lighting the fuse, creating fire for what gives force...maybe we all can use a bit of "ignition" to put our various talents and powers to good use. Check out the book's career and fame section pages! AND, be powerful protectors of doing the "correct thing"! 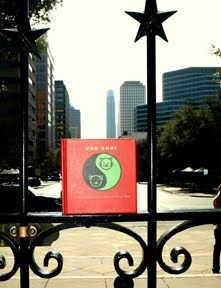 Fur Shui is still in Austin TX! Touring the capital and seeing the sights. 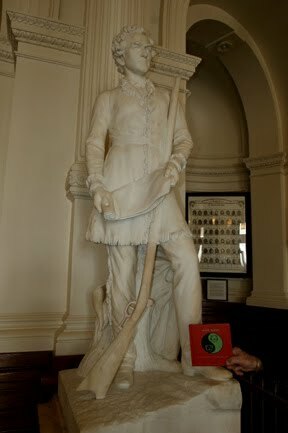 Seen outside "approaching" the Capital building and rubbing elbows with two very famous Texas figures...beautiful marble statues of both Davey Crocket (guy with hand up to his chin), and Sam Houston (guy with scroll!). 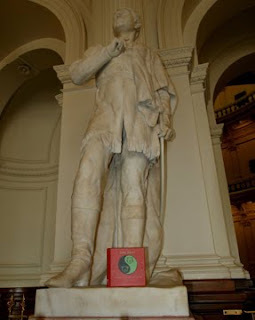 Stone is a very grounding Earth element that belongs to the middle gua (life space) of the bagua...the Health and Balance life space. 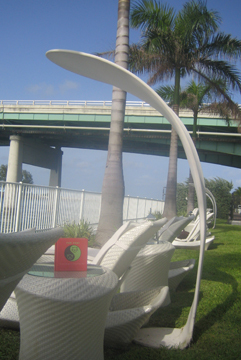 Honoring health and well being are essential to one's life...the center of everything we do! Both these statesmen were active vital beings, using their good health and fortune to help others and establish Texas. 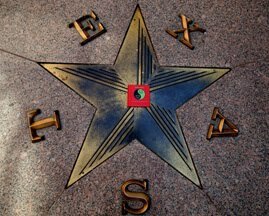 You can add a healthy walk through famous places to encourage your own health and get a history lesson while you are at it...visit the capital in Austin, Texas! Helllllllooooo Austin! 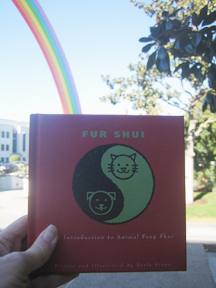 Fur Shui has come to visit the capital! What fun. 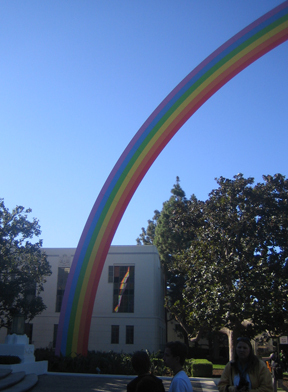 Fame and political reputation depend on the good marriage of "red" and "green". 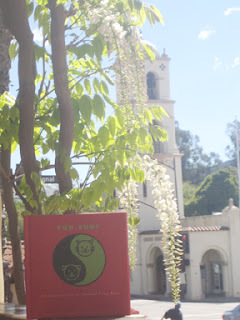 Green being for family and community, red for reputation and fame. Maybe we all could work on the "reputation" thing when it comes to politics?! 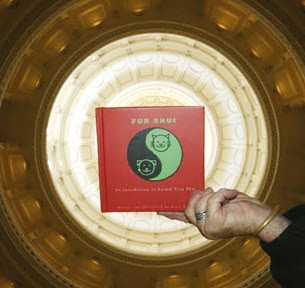 Here's Fur Shui framed in the rotunda below the capital dome...framing the city view from the iron gates...and then FAME itself...inside a Texas Star. 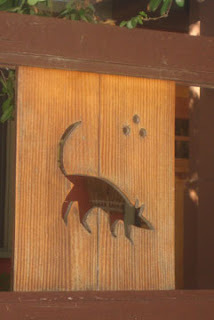 The Star is the ultimate "pointy" object one can place in the fame gua or life section to tempt the chi to be strong and flowing for you and your fur folks. Salute to Austin...fame and fortune for all who use Fur Shui in and out of their environment! 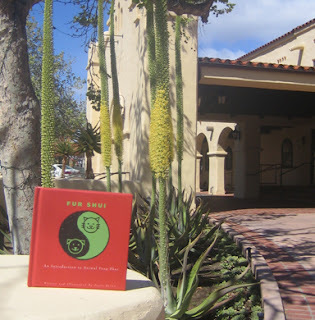 Was a great day of creative balance for Fur Shui at the Ojai Studio Walk tour. Fabulous art and people using the day to celebrate their talent and fame. The red cover for fame as well as the green for "community" stands out along artist Christine Brennan's home fence. Art is everywhere, making up fences, homes and studios. 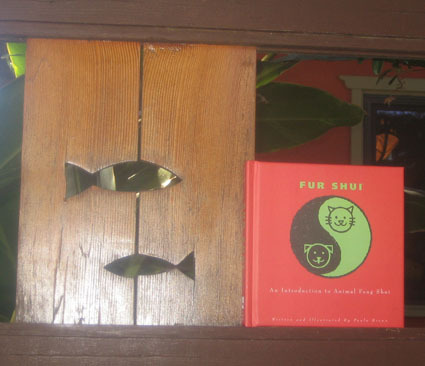 Note the curious mouse panel along with the fish swimming by Fur Shui! Fame and fortune to all who participated!